Deion and Pilar join a downsized Al Roker on Celebrity Family Feud. NBC has amassed 24 "All-Star Families" for its Al Roker-hosted Celebrity Family Feud, set to premiere on July 1st. 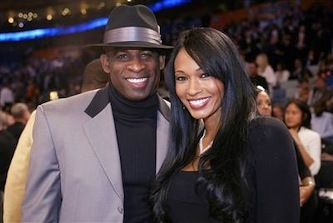 In one of the matchups, Deion Sanders, wife Pilar, son Deion Jr., daughter Deiondra and Aunt Annette will take on The Kardashians, who include former Olympic decathlon champ Bruce Jenner and his now seasoned but still badly executed face lift. Teams are playing for charity, and the Sanders have designated Deion's "SandersClaus."